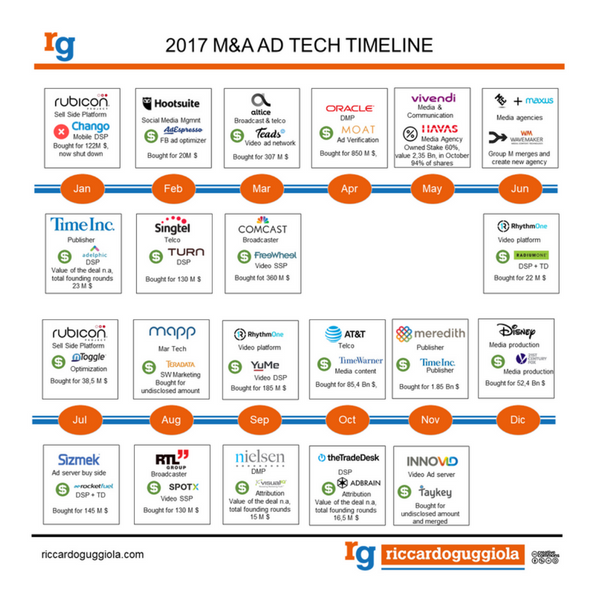 An infographic to look back to the 2017 shows the ad tech and media industry is consolidating and simplifying models and what could we expect in the next 2 years. Today the digital advertising market is mainly technology and strategic moves from players which try to fight the duopoly Google and Facebook. 2017 has been clearly a year of consolidation of business models, and showed many acquisitions, mainly from the US market affecting Europe’s digital landscape. Hereby the infographic which shows some highlights of the 2017 M&A deals, divided per month. Worthy to mention is the Disney acquisition of Fox, the deal includes also the 60% of Hulu. Disney strategy is to own more content and distribute it. Maybe it will become the main rival of Netflix for content fruition of OTT content. In 2018 and the following years, I expect broadcast will evolve in an hybrid version video content distribution where users watch using multiple device and on demand and the Disney move make perfect sense in this context. Try to mention another player which is doing the same. Yes, Amazon is considered to become the most potential competitor for Facebook and Google in the advertising, with the advantage that it knows what consumers actually bought. Amazon is also making own content, and the farsighted Google did not like it. If you are thinking to buy an Amazon Fire TV, well, you cannot install the Youtube app. As Google and Facebook are interested in becoming incumbent in media production also for live events, broadcasters and operators acquired ad tech companies to manage their inventory for the next generation of users. RTL Group bought SpotX and its plan is to merge it with Smartclip, which bought a year earlier. Same thing happens for Comcast, which early in 2017 bought FreeWheel (formerly Sticky Ads). M&A in digital advertising seems to bring also this clear statement: if you started on the sell side, you continue on the sell side and try to better manage the audience as better as you can. Lesson learned by the incumbent SSP Rubicon Project, which bought in 2016 Chango to try to enter the buy side market albeit without success. In fact, in the early 2017 they sold the business and got back in what they are good at. The advertising landscape will drastically change within 2 years. By 2020, half of the ad tech players represented on the LumaScape will rebrand, drastically reconsider the business model or declare bankruptcy. Need of transparency by who is investing: consequent elimination of intermediaries and likely adoption of blockchain technology to manage IO and advertising contracts for each impression. Data management and protection: GDPR and ePrivacy starting in may 2018 and becoming fully effective within 2 years, will let users know more about their rights and how data are used to track them. Default Ad blockers and users’ attention: progressive elimination by browsers of invasive ads, less advertising more value determined by user’s attention. Again, blockchain technology could help building a distributed business model, where user is rewarded for his/her attention and engagement. The business models will evolve accordingly. Digital publishers still need to focus on content, lower advertising pressure, increasing value of advertising by providing content, preferably video of max 3 min audio-off. Operators and broadcasters enter massively in the digital advertising business, for the consequent development of addressable TV advertising, which is essential for a cross channel advertising strategy. Data Management Platforms will evolve in Customer Management Platforms, a sort of expanded CRM to manage current and potential clients, tracking them with device ID graph and identity management systems, integrating all the features of a marketing and advertising strategy. Ad tech providers for the sell side will consolidate, the smaller companies (15 M $ turnover and less) will disappear or be acquired and dismissed together with all the middle/small ad networks using other’s technology. New tech companies will appear in the soon future, the winning strategy is having both demand and supply and maybe power the system with blockchain. Advertisers have the money and want to spend more wisely from now on. They will internalize resources or ask external consultants to keep the pace of the digital investments across all devices and manage operations. My digital generation is used to liquidity and changes, but we don’t have to forget the most important thing: the user. And eventually the secret relies on time the user have to dedicate. M&A in the next 2 year, will happen only if companies interested in selling will demonstrate to their acquirers they can build engagement and a positive relationship with the audience.